We all kept hearing about Laura's obsession with her holiday decorating trying to outdo Larry the neighbor. 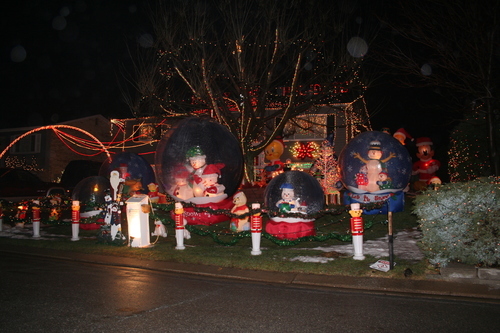 Well, I drove past her and Debby's house and I must say it looks like Santa threw up on their lawn. (Stole that line from Grey's Anatomy.) There's a thin line between good taste and tacky. And I think that line is hidden somewhere behind Tweety bird. Seriously folks. There is so much here that you can't see. Un-freakin'-believable. And the house isn't really in New Jersey. I just made that part up. Love you Deb and Laura. Almost forgot. See the white box by the curb? These kind people collect money for the American Lung Association. God Bless them. And their neighbors. Wow! That is something! Of course, my kids would have loved to see that. LOL, um I would love to see the REAL shot. Where the hell do you store all that stuff! what? you think its too much? Okay, so you found us.. Geeeez, I thought we were so careful keeping our address a secret. Why didn't you come in for a glass of wine?? ?